Even though Twitter is one of the most minimalistic social services available, it's also one of the hardest to understand and master. We all know people who are having problems with it , and to be frank, it took us quite some time to get Twitter too. We are not saying we are social media ninjas now, but we do know a few things and are acquainted with various best practices on Twitter. And we've built some of that into Twenity. Heavy Twitter users and social media professionals can use Twenity to see how they're performing and what kind of reactions their actions have triggered. But Twitter rookies and casual users (for whom this post is intended), they are the ones who are usually facing bigger problems and need someone to guide them to through the wonderful world of Twitter. Twenity can help. Twitter is all about interaction, and there are many forms of it. From following someone, replying to them, mentioning or even retweeting them. Each of those actions has its weight on Twenity. A reply has little weight since it's only seen by the people who follow both accounts. Retweets have the most weight, since they are the ones who help spread information. Mentions are somewhere in between. Technically, replying or mentioning people will unlock a few badges, but temporarily lower your score on Twenity, since the calculation works with ratios (followers vs. following, replied vs. replies, etc.). But if you'll get feedback, your score will suddenly become higher. Perhaps you'll even get new followers and meet new interesting people. The bottom line is that have to do things on Twitter, and Twenity will be there to show you how successful your actions were. You should follow people that share your interests and tweet if you want to get noticed, and don't worry, there's an audience for everybody. Besides, don't get scared of being ignored, these things happen even to the best. 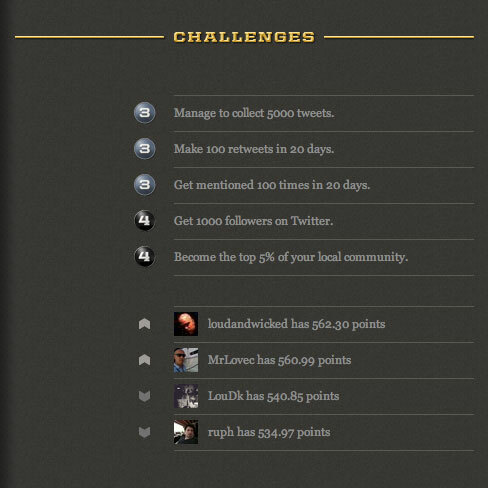 Challenges on the dashboard that unlock Twenity badges require players to do various things, and they cover pretty much everything you can do on Twitter. By letting them guide you, you will sooner or later get the idea of how things work, and the more of them you'll unlock, the better you'll become. In the end, you will see Twitter is pretty simple to use and amazing things can be achieved with it. All you need to do is to have fun. We are very grateful for all the feedback we've received about Twenity on various channels. We were all ears and the results are finally here. As you probably know, Twenity is intended to behave like an adventure on top of you Twitter activity. While this may have been our plan, some players were still having problems: Where is the adventure? What do I have to do here? Well, guess no more - the newly introduced Dashboard solves most of these issues, with style. The timeline makes Twenity even more social. It allows you to see how people you follow perform on Twenity and when they made their calculations, unlocked badges and went level-up. Once you start playing Twenity, it's hard to see any new friends that also started the game. The Latest friends module displays the last five people you follow that have registered to Twenity. 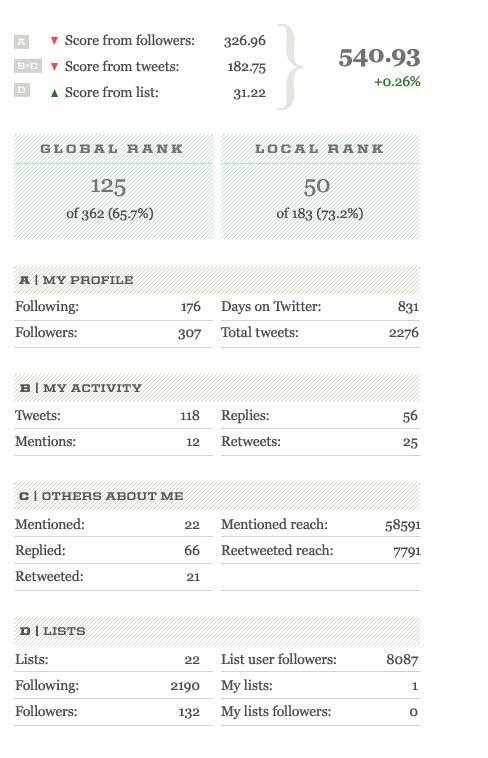 The Dashboard displays your profile with a bit more data than it's available on the general profile page. 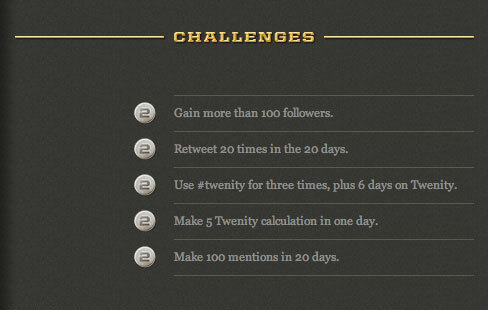 We wanted to show you more - how many calculations you've made, how many badges you've unlocked in total, and how many #twenity tweets you've sent to the world. Twenity allows you to unlock badges and go through different levels. While you can always browse other people's profiles to see what you have to do for the next badge, we've decided to make it a bit easier. The Challenges module displays the next 5 badges we think are the easiest for you to unlock, helping you conquer the world of Twitter (and Twenity). 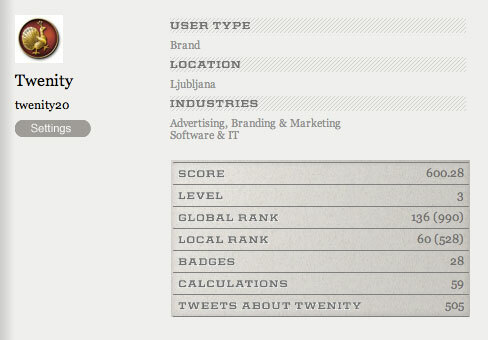 The are people you know who scored similar than you did on Twenity, some of them better, some of them worst. We know what you want to do with them – beat those in front of you, and run away from those behind you. Two of each are shown here, more are available on your profile leaderboard (friends – proximity). So you always know who you're competing against. Besides the main challenges, Twenity will be giving players some additional badges. The first group of these badges has been available since our launch, the promoted badges for following accounts on Twitter. Since these have become quite popular, we wanted to make sure you don't miss them. There are a few other things coming up on the Dashboard, which we'll be publishing as we go along, but we had to start somewhere. Thank you again, because of your interest and feedback, Twenity is evolving at a really fast pace, and we hope you like the newest updates as much as we do.